Alumnus Tony Thomas (BA 1963, MA 1970) was well placed to write about UWA during his time as a journalist at The West Australian – he spent 10 years in part-time study at the University’s Perth campus. A former economics writer for The Age in the Canberra Press Gallery and Associate Editor with BRW magazine, Melbourne-based Tony is now retired, however still writes on politics and climate for Quadrant magazine. 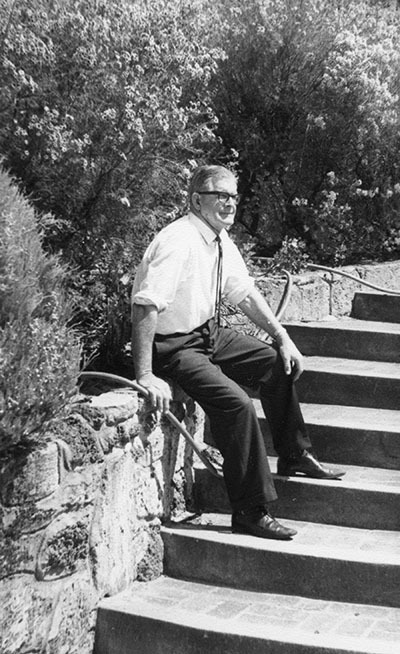 Tony penned this piece about UWA’s first-ever gardener, George Munns, in 1965 - it was published the day before Christmas. Uniview thanks him for allowing us to reproduce it. "How do you keep the university grounds so nice?" I asked Mr George Munns as he fled around the toolshed. "Brute force and ignorance," he flung back, disappearing. The University’s curator of gardens is a retiring person, blending with the stipple of his shrubs and greenery in much the same way as the University itself blends with its garden setting. Because Mr Munns has nursed and watered these grounds for 34 years, every student must be in his debt. The all-encompassing greenery is to students as a cup of tea is to housewives or a sleeping pill to insomniacs; it is balm for book-worn eyes and incense for nostrils that for too long have consorted with fumes and chemicals in the science blocks. Cornered in his office after protestations, Mr Munns weakened. "In 1932 when the depression was on, I got a fortnight’s work here. "What were you then?" I asked. "I was a thing. I was out of work," he said, summing up an era. "I cleared some of the bush here to make a site for the old tin huts from Irwin Street. There was a hue and cry about putting unsightly buildings on the University grounds. The University authorities said they were to be only temporary. They are still here. There is nothing so permanent as temporary buildings. "I clung on here on sustenance work, breaking up the ground with a horse and Tumbling Tommy. "What’s that?" "Come and see." I followed him through some undergrowth and there it was, an iron scoop the size of a baby’s bath with wooden shafts broken off short. "I keep it here," he said. "Put in new shafts and it may come in handy one day. It is not eating anything." I doubted privately that the campus would ever again be scratched by Tumbling Tommy. His boss in those days was Dr Somerville, he said, a staunch upholder of keeping trees, even sometimes to the ridiculous. "What do you mean by that?" "He was very dogmatic," Mr Munns said, guardedly. So time went on. I got married, I got a university rental house, the war came on, I went in the war. I stayed on here because it developed that way, that’s all. Now he is in charge of 23 gardeners. His hair has greyed and his short moustache is white. He looks younger than his 59 years, though his gardener’s arms and hands, leathery and scarred, seem to have done more than a lifetime’s work. "I live on the campus here 24 hours a day. After the years, you get attached to everything. You see dozers for car parks coming in, you want to rear up and do something about it. Someone spits on the ground and you want to say, 'Clean it up!'" The phone rang. "You’ve got three rams just near the Perry Lakes stadium," he acknowledged to the caller. "I’ll tell the men to look out for a truck." He explained that the University had gone in for sheep again – 72 ewes, ex-York, were grazing at Shenton Park. He wanted to build up a flock again. The original university flock had to go when campus development broke up the enclosures. One of the best things we ever had was sheep. One time when the Yanks were here, they befriended one young ram. They even used to take it on parade with them. "Then it disappeared and we found out much later that some Yanks had put it in their Catalina and taken it up north with them as a mascot. It probably wound up in the pot though." He bore the aviators no grudge. "Some of the chaps in the Catalinas got beheaded," he said. Dogs were the sheep’s worst enemy. Packs of them would savage the flock and even when he traced dogs back to their homes, their owners would resolutely deny that their dogs had killed the sheep. "The dogs disappeared in the end. The sheep must have eaten them," he concluded. He had many other stories from days long past - of the first residential summer school held in tents under the trees, with billiard tables used as beds; how money was so tight when Winthrop Hall pond was being built that they surfaced it with sweepings off the floor of a cement works; how Bob Hawke, now the razor sharp trade-union advocate, drove a horse and dray for the gardeners to earn money for his student days; how the University’s parking worry used to be to provide enough bike sheds. "People were just as happy in those days." The Sunken Gardens, I learnt from Mr Munns, was the hole the University emerged from – the sandpit used for the building of Winthrop Hall. Mr Munns cherishes three events. 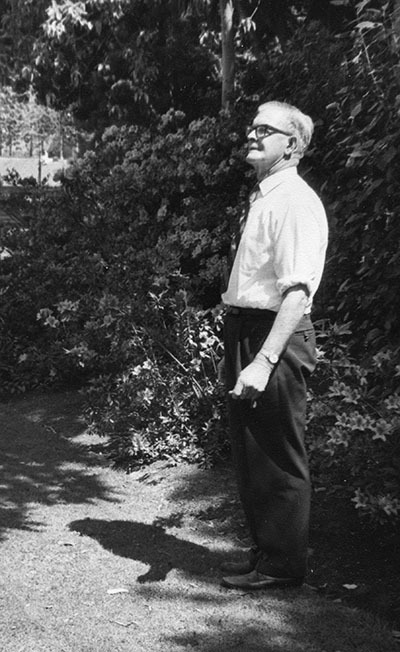 The first was 25 years ago when he successfully transplanted a Christmas tree near the old physics building. That was a feat that had not been done often, he said. The second was transplanting some 60ft-high poplars growing at Rosalie to the rear of Winthrop Hall. But the biggest moment of my life here was when I met the Queen. She planted some trees here. She just turned the spade actually, the hole was there already. "She talked to me for quite a while. She was very decent." Photographs courtesy of the wonderful Maria and Lesley at UWA Archives - thank you. Tony Thomas is currently compiling his second book of essays. His first is published by Connor Court Publishing.